LG Electronics bolstered its B2B signage product lineup at Integrated Systems Europe 2018 last month. With its four new OLED products, LG is targeting business environments in places such as retail, public spaces, and offices. Specifically, LG points at the retail, government, hospitality, education, and transportation industries as those industries that can benefit from these new products. The big design reveal for LG is its new 55-inch Transparent OLED signage (pictured above) that the company says will be ideal for retail environments and art galleries. Use cases for this type of signage include placing products – or in the case of an art gallery, art – behind video or special effects displayed on the see-through display. The new product line focuses on simplicity, with improvements such as millimeter-thin bezels, increased brightness, and improved anti-glare technology. Supposedly, these improvements will take away any distractions like large bezels on displays. That mentality is apparent with the new 0.6mm-thin Even Bezel Video Wall designed for high-end product advertising in fashion and beauty. 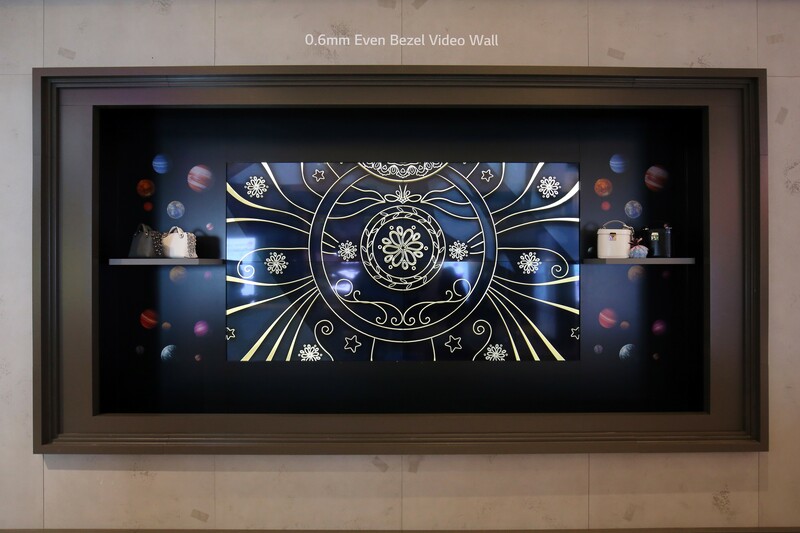 With barely noticeable bezels, this video wall can blend in with product displays. Additionally, LG has revealed both 86- and 88-inch Ultra Stretch displays designed for displaying directional information or inspection notices in multiple foreign languages due to its stretched form. Its flight information display systems (FIDS) have also been improved with advanced anti-reflection so that those travelling can view the screen glare-free despite the angle. At the show, LG also showed off its Advanced IPS Interactive Digital Boards (IDB) that have UHD picture quality and are touch-enabled. The IDB displays have precise writing performance so that multiple users could write on it simultaneously. For pricing and availability for all of LG’s new B2B signage products, you can either contact LG directly, or work through one of its partners.